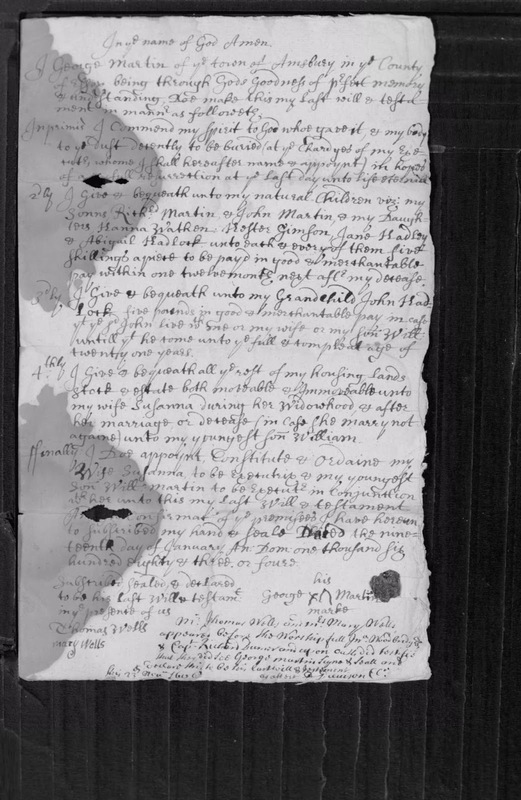 Genea-Musings: Amanuensis Monday - Will of William White (1708-1780) of Dartmouth, Mass. Amanuensis Monday - Will of William White (1708-1780) of Dartmouth, Mass. Dispose of the same in the following manner & form. wareing appariel of all Sorts. thereon standing & other Priviledges thereunto belonging. Building & other Priviledges therunto belonging. Except what I Shall herein after Give to my Three Daughters. my Blacksmith Tools also all my Carpinders Tools. I do hereby give her. her full Part & Portion in my Estate. hath already had to be her full Part & Portion in my Estate. which is herein given him. & Charges which is herein ordered. made Rattifying this & no other to be my Last will & Testament. Set my hand & seal y^e day & year above written. 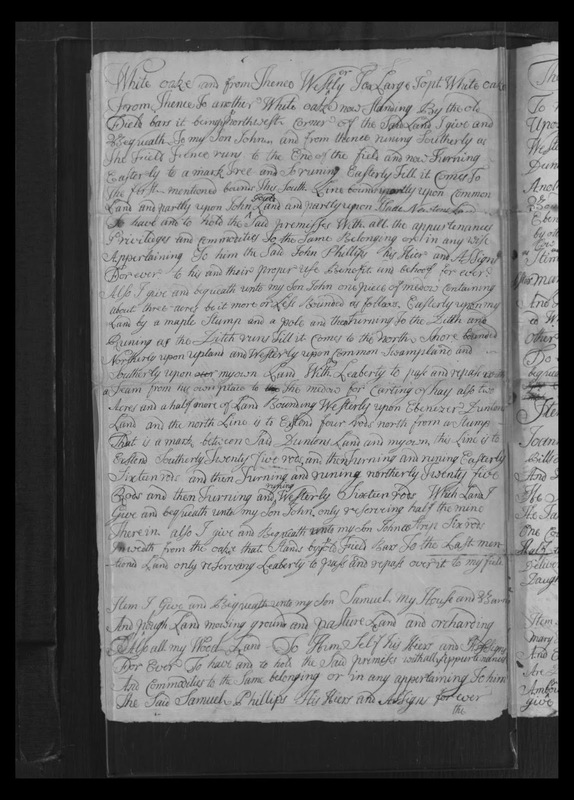 The source citation for this document is:Bristol County, Massachusetts, Probate case files, Case file 28021 - William White 1780; "Bristol County (Massachusetts) Probate Records, 1636-1899," digital images, New England Historic Genealogical Society, American Ancestors (http://www.americanancestors.org : accessed 17 May 2018). 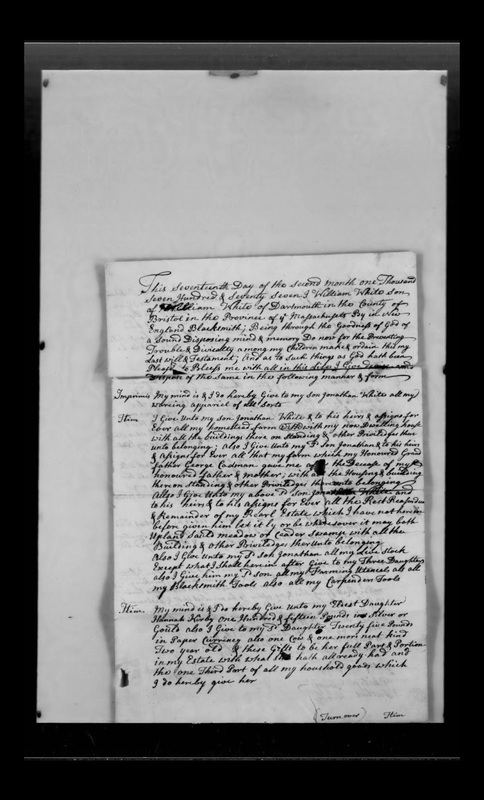 The will of William White was written on 17 February 1777, and was proved in Bristol County probate court on 3 October 1780. 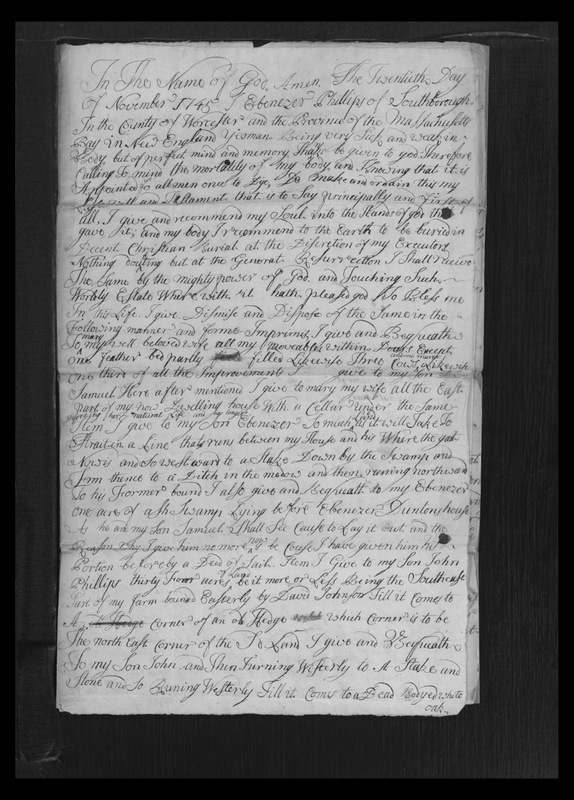 The estate inventory is very long but defines all of the real and personal estate of William White. William White (1708-1780) was the son of William White (1683-1777) and Elizabeth Cadman (1685-1768). He married Abigail Thurston (1700-1770) in 1729, and they had five children. Daughter Sarah White died before William wrote his will. The will provides for the remaining four children. Son Jonathan White is given the wearing apparel and all of the real estate, but has to pay the debts, charges, and the legacies given to his three sisters - Hannah Kirby, Elisabeth Peckham and Abigail White. 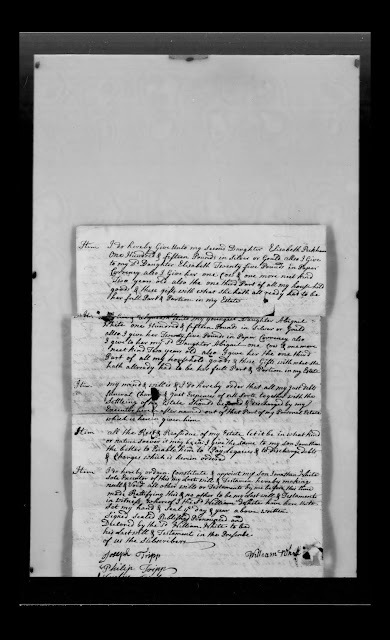 William White is my 6th great-grandfather, through his only son, Jonathan White (1732-1804) of Westport, Massachusetts, who married Abigail Wing (1734-1806) in 1756.